I will be in Lucca, Italy (!!) 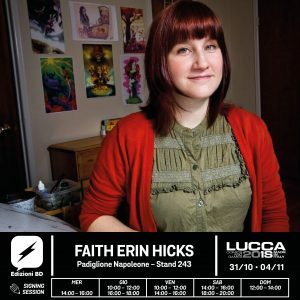 from October 31st until November 4th for Lucca Comics & Games, the second largest comic convention in the world! Very excited about this. Here’s a little graphic (in Italian) that has my signing times on it. You can find me with my Italian publisher, Edizioni BD, at Stand 243 in the Padiglione Napoleone. They will be debuting the publication of the Nameless City trilogy (yes, all of it!) in Italian. Above are my signing times (Mer is Wednesday, Dom is Sunday). Hope to see some readers in Italy!